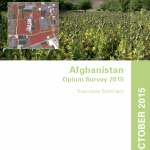 The report presents the key findings of the Afghanistan Opium Survey 2015. The full report on cultivation and production will be published in November and a separate report with a socioeconomic analysis will be presented early 2016. The survey is implemented annually by MCN in collaboration with the UNODC. The survey team collects and analyses information on the location and extent of opium cultivation, potential opium production and the socio-economic situation in rural areas. Since 2005, MCN and UNODC have also been involved in the verification of opium eradication conducted by provincial governors and poppy-eradication forces. The information is essential for planning, implementing and monitoring the impact of measures required for tackling a problem that has serious implications for Afghanistan and the international community. 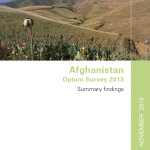 The Afghanistan Opium Survey is implemented annually by the Ministry of Counter Narcotics (MCN) of Afghanistan in collaboration with the United Nations Office on Drugs and Crime (UNODC). The survey team collects and analyses information on the location and extent of opium cultivation, potential opium production and the socio-economic situation in rural areas. Since 2005, MCN and UNODC have also been involved in the verification of opium eradication conducted by provincial governors and poppy-eradication forces. The results provide a detailed picture of the outcome of the current year’s opium season and, together with data from previous years, enable the identification of medium- and long-term trends in the evolution of the illicit drug problem. This information is essential for planning, implementing and monitoring the impact of measures required for tackling a problem that has serious implications for Afghanistan and the international community. Afghanistan is the world’s largest producer and cultivator of opium poppies; it produces almost three quarters of the world’s illicit opium. While a significant amount of the opium produced in Afghanistan is trafficked out of the country, in 2009 it was estimated that almost 10 per cent of Afghans aged between 15 and 64 were drug users. 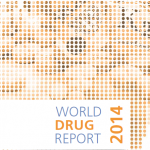 The World Drug Report provides an annual overview of the major developments in drug markets for the various drug categories, ranging from production to trafficking, including development of new routes and modalities, as well as consumption. A total area of over 62,000 hectare of opium poppy cultivation took place in Lao People’s Democratic Republic (Lao PDR), Myanmar and Thailand in 2013. In order to assess the scope of opium poppy cultivation and opium production in the region, UNODC has been conducting opium surveys in cooperation with the Government of Lao PDR since 1992 and the Government of the Republic of the Union of Myanmar (GOUM) since 2002, while Thailand established its own monitoring system. 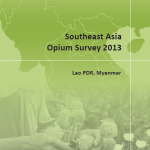 This report contains the results of the 2013 UNODC-supported opium poppy cultivation surveys in Lao PDR and Myanmar. In addition, the results from the opium poppy surveys implemented by the Government of Thailand are presented in this regional overview. 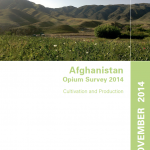 Opium poppy cultivation in Afghanistan reached a sobering record high in 2013. According to the 2013 Afghanistan Opium Survey, cultivation amounted to some 209,000 hectares, outstripping the earlier record in 2007 of 193,000 hectares, and representing a 36 per cent increase over 2012. In a restricted report issued in May, the DEA detailed the most recent findings from its heroin monitoring program, assessing the period from 2006 -2011. 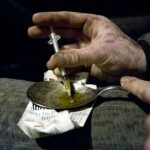 The report finds that heroin in the U.S. generally comes from two different places: South America and Mexico. If you live east of the Mississippi River, chances are that the heroin you’re buying is from South America. Heroin purchased on the West Coast is almost certainly trafficked from Mexico. Some heroin from Southwest Asia does make it to the U.S. However, the amount is minimal compared to other sources and the quality is relatively poor. 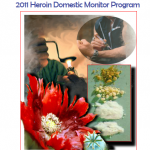 This report presents data and conclusions from the Heroin Domestic Monitor Program (HDMP) conducted by the Drug Enforcement Administration (DEA) for calendar year (CY) 2011. The HDMP provides data on the price, purity, and geographic source of heroin sold at the retail level in 27 U.S. cities. The data contained in this report are based on actual undercover heroin purchases made by the DEA and its law enforcement partners on the streets of these cities. Afghanistan cultivates, produces and process narcotics that are a threat to the region and worldwide. However, the international community also needs to understand that Afghanistan itself is a victim of this phenomenon. The existence of hundreds of thousands of problem drug users, as well as decades of civil war, terrorism and instability are all related to the existence of narcotics in the country. According to the findings of this survey, the total area under cultivation was estimated at 154,000 hectares, an 18 per cent increase from the previous year. Comparisons of the gross and net values with Afghan’s licit GDP for 2012 also serve to highlight the opium economy’s impact on the country. In 2012, net opium exports were worth some 10 per cent of licit GDP, while the farmgate value of the opium needed to produce those exports alone was equivalent to 4 per cent of licit GDP. On the basis of shared responsibility and the special session of the United Nation’s General assembly in 1998, the international community needs to take a balanced approach by addressing both the supply and the demand side equally. In addition, more attention needs to be paid to reduce demand and the smuggling of precursors as well as provide further support to the Government of Afghanistan. The findings of the 2013 Opium Risk Assessment in the Southern, Eastern, Western and Central regions points to a worrying situation. The assessment suggests that poppy cultivation is not only expected to expand in areas where it already existed in 2012, e.g. in the area north of the Boghra canal in Hilmand province or in Bawka district in Farah province but also in new areas or in areas where poppy cultivation was stopped. In eastern Afghanistan, in Nangarhar province, farmers resumed cultivation even in districts where poppy has not been present for the last four years. In the Northern and Northeastern region, the provinces of Balkh and Takhar which were poppy-free for many years are at risk of resuming poppy cultivation. Despite the eradication of opium poppy by Governor-led Eradication (GLE) having increased by 154% in comparison to its 2011 level (9,672 hectares eradicated in 2012), the total area under opium poppy cultivation in Afghanistan was estimated at 154,000 hectares (125,000 – 189,000) in 2012. While that represents a 18% increase in cultivation, potential opium production was estimated at 3,700 tons (2,800 – 4,200 tons) in 2012, a 36% decrease from the previous year. This was due to a decrease in opium yield caused by a combination of a disease of the opium poppy and adverse weather conditions, particularly in the Eastern, Western and Southern regions of the country. Despite the continuous counter-narcotics efforts of the international community and the Afghan government throughout the past decade, Agence France-Presse wrote in April 2012 that Afghanistan continues to be a major contributor to the global drug supply. Approximately 90% of the world’s opium, most of which is processed into heroin, originates in Afghan fields. While potential opium production in Afghanistan peaked in 2007, poppy cultivation has recently risen. For instance, the United Nations Office on Drugs and Crime (UNODC) marked a 61% increase in the potential opium production between 2010 and 2011. 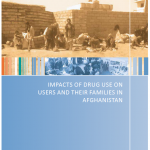 A separate UNODC report from 2010 states that drugs and bribes are equivalent to approximately a quarter of Afghanistan’s gross domestic product (GDP). The Ministry of Counter Narcotics (MCN) and the United Nations Office on Drugs and Crime (UNODC) have joint responsibility of monitoring and verifying opium poppy eradication activities led by the Governors. Governor-led eradication activities are envisaged in all poppy cultivating provinces. Two MCN/UNODC reporters are deputed in MCN for collection of daily reports from the field verifiers and two MCN staffs are assigned for preparing weekly report under UNODC supervision as a part of capacity building activity. The total area under opium poppy cultivation in Afghanistan in 2011 was estimated at 131,000 hectares (ha), a 7% increase compared to 2010. 95% of total cultivation took place in nine provinces in the Southern and Western regions, which include the most insecure provinces in the country. This confirms the link between insecurity and opium cultivation observed since 2007. The number of poppy-free provinces decreased from 20 in 2010 to 17 in 2011 as Baghlan and Faryab provinces in the Northern region and Kapisa province in the Eastern region lost their poppy-free status. Potential opium production in 2011 was estimated at 5,800 mt, a 61% increase compared to 2010, when opium yields were much reduced due to plant diseases. The result of this assessment indicates that the current high price of opium did not produce an increase in opium cultivation in the highest cultivating provinces of Hilmand and Kandahar. In these two provinces the cultivation is expected to decrease in 2011. The reasons for this development were multiple and differed from area to area. In parts of Hilmand and Kandahar, farmers reported the persistence of cold and dry climate conditions which led to crop failure as the poppy would not germinate. There also been a changing political environment in Hilmand with the Governor taking initiatives to convince elders and farmers to reduce the amount of poppy planted. This was not systematically captured by the survey, but it may have played a role as well. In both provinces, military operations were conducted by Afghan and international forces around the time of poppy planting in main poppy cultivating areas. Although these operations were not directed against poppy farmers, the coincidence of troupes being present at planting time may also have discouraged farmers from planting poppy. The magnitude and importance of Afghanistan’s opium economy are virtually unprecedented and unique in global experience —it has been roughly estimated as equivalent to 36% of licit (i.e. non-drug) GDP in 2004/05, or if drugs are also included in the denominator, 27% of total drug-inclusive GDP (see Chapter 2). The sheer size and illicit nature of the opium economy mean that not surprisingly, it infiltrates and seriously affects Afghanistan’s economy, state, society, and politics. It generates large amounts of effective demand in the economy, provides incomes and employment including in rural areas (even though most of the final “value” from Afghan opium accrues outside the country), and supports the balance of payments and indirectly (through Customs duties on drug-financed imports) government revenues. The opium economy by all accounts is a massive source of corruption and undermines public institutions especially in (but not limited to) the security and justice sectors. There are worrying signs of infiltration by the drug industry into higher levels of government and into the emergent politics of the country. Thus it is widely considered to be one of the greatest threats to state-building, reconstruction, and development in Afghanistan. The majority of the 20 Afghan provinces that were poppy-free in 2009 will remain so this year. Yet, three provinces (Baghlan, Faryab and Sari Pul, all in the north) risk showing the beginning of a trend reversal, with a minimal increase in cultivation in the districts with higher insecurity. Five other provinces (Kunar, Nangarhar, Kabul, Laghman and Badakhshan), not poppy-free so far, are also expected to have negligible amounts of poppies. (U//FOUO) JIEDDO Report: Alternative Motivations for IED Use in Afghanistan, December 11, 2009.